Bacon and onion jelly sandwiches. Food on wood board. Two sandwiches on wood board. 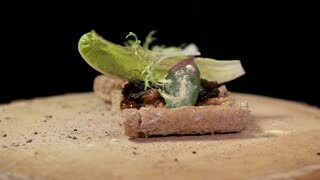 Bacon jam and lettuce. Hands preparing cheeseburger. Wood board and burger. Fast food sandwich recipes. Hands of man making sandwiches. 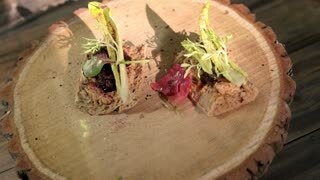 Duck pate and bacon jelly. Onion and bacon jam sandwiches. 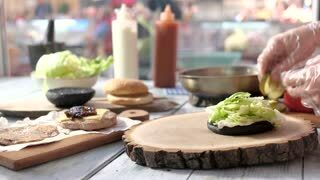 Food on a wooden table. Healthy food for lunch. Two sandwiches on wooden board. Duck meat and onion jelly. Light and healthy snacks. Onion and bacon marmalade sandwiches. 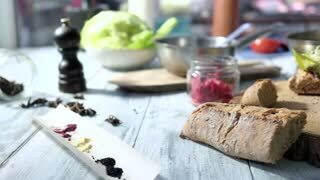 Wooden board with food rotating. Bacon and onion jam sandwiches. 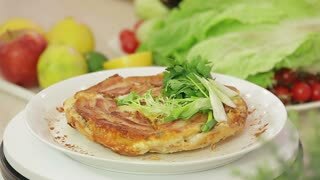 Lettuce and duck meat. Light snack for two. Onion and bacon jelly sandwiches. 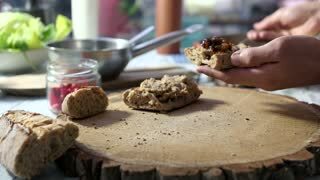 Food on wooden board spinning. Sandwich and fries close up. Fast food meal, wood board. 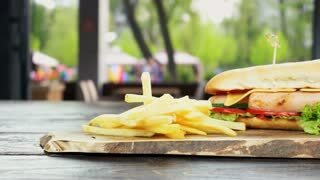 Sandwich and fries, wooden board. Tasty fast food close up. Fast food on wood board. Sandwich and fries.